Ordering for the new John Deere L331 and L341 balers begins in September 2017. 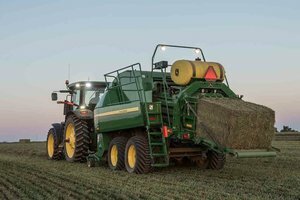 John Deere has announced the new L331 and L341 Large Square Balers, which will join its lineup of existing balers in 2018. These models are specifically designed to transform hay-making into an easier process for producers. With the MegaWide™ pickup, both the L331 and L341 enhance efficiency on the job. "They are a perfect fit for commercial hay producers, as well as larger dairy and beef producers, who demand more consistent bale densities with less crop loss, and who want to spend more time baling and less time clearing plugs and servicing the machine,” says Travis Roe, senior marketing representative for hay tools for John Deere. The two models will replace the L300 Series Large Square Balers that were introduced in 2015. They come with a feed system created to work under a wide variety of haying conditions. A wider, more robust standard 7.2-foot MegaWide pickup (with optional 7.2 feet and 8.2 feet Premium MegaWide) boosts the machine’s performance and overall reliability. The L331 and L341 also come with a new inline, undershot rotor, heavy-duty roller baffles, and gauge wheels. Operators can opt for BalerAssist™ when they purchase their machine, which makes it simpler to clear plugs directly from the cab. Each baler comes with a new electronic knotter trip option to improve bale length consistency during twine tying. "These two balers offer a significant increase in productivity, consistent bale density and baling speed and control compared to previous models and competitive machines on the market today,” Roe adds. More information on John Deere balers can be found by visiting www.Deere.com or by contacting your local John Deere dealer.